Micellar Water is produced by the Ukrainian cosmetic company Elfa for its Dr. Sante Cucumber Balance Control series. It is a 2-in-1 beauty product as it helps to clean your skin from make-up and dirt as a make-up remover and freshens your skin as a skin toner. The product is specifically designed for combination and oily skin, but it is suitable for other skin types as well. 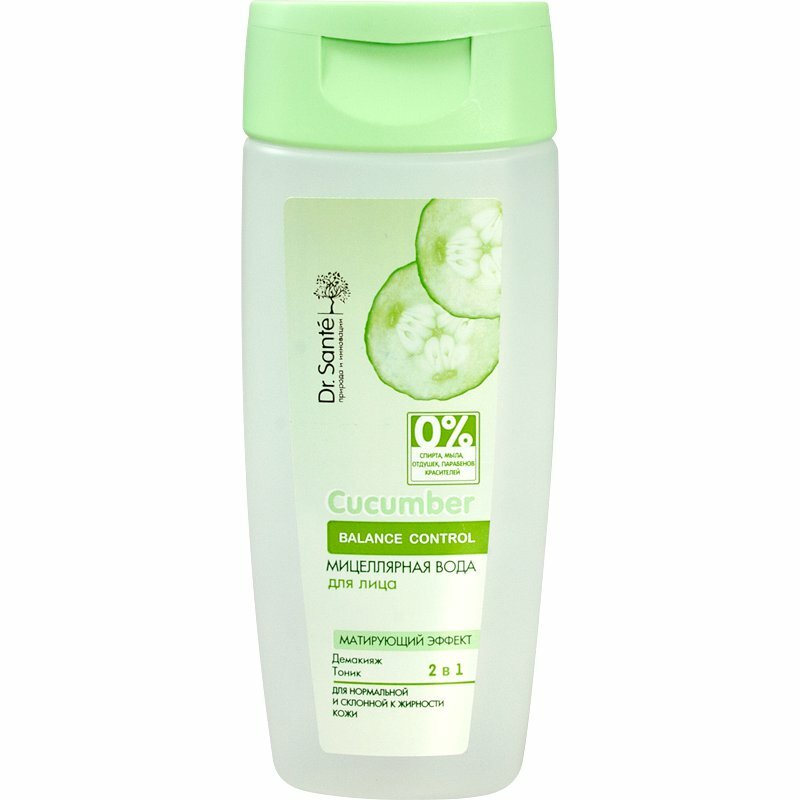 Cucumber Balance Control Micellar Water is formulated with special soft water. It contains micelles, special nano-sized particles with the hydrophilic and hydrophobic poles which are able to absorb sebum, oil and other fats. Micelles do not absorb water, that is why micellar water cleanses your skin effectively yet gently without drying it out. The special formula of Cucumber Balance Control Micellar Water is designed to make it a universal product. It cleans the skin from dirt, excess sebum and make-up residue, freshens it and improves skin elasticity. The product is suitable for daily use. It can even be used to clean gentle skin around the eyes. It is recommended for use in various situations, including long-distance travel and hiking trips. 0% alcohol, soap, fragrance, parabens, colourants. Does not dry and irritate your skin. Directions. Soak a sponge in micellar water and gently wipe the face, neck and chest area. Blot the residue with a clean washcloth or paper tissue. Does not require rinsing. Ingredients. Aqua, Poloxamer 184, Sodium Chloride, Disodium EDTA, Dipotassium Phosphate, Polyaminopropyl Biguanide. Want to buy Micellar Water? Call us or submit your order via our web site! Dr. Sante Cucumber Balance Control is a well-known Ukrainian cosmetic brand. It is produced by the group of companies Elfa whose cosmetic and household products are well known both in Ukraine and abroad. The concern includes companies operating on the territory of Ukraine, such as ZAO (JSC) Elfa and Pharmaceutical factory NPO (scientific and production association) Elfa as well as production sites in Poland. The history of the corporate group Elfa began in 1997 when ZAO (JSC) Elfa was officially opened. The first brand of the rapidly developing company was named Magic of Herbs. It was launched in 1998. Within the next couple of years Elfa launched two more brands, Popelyushka (Cinderella) and Active. Since then, the company’s production capacity has been progressively growing, and the number of new cosmetic and household brands has been growing with it. The brand Dr. Sante Cucumber Balance Control was launched in 2004, then it was known simply as Dr. Sante Cucumber. It hasn’t lost is popularity in over a dozen years! This cosmetic line is specifically designed for oily and combination skin. It is formulated with natural ingredients which help to normalise sebum secretion and cope with common oily skin problems such as enlarged pores, greasy shine, clogged pores, akne, inflammation and others. In 2013, the brand Dr. Sante Cucumber was relaunched and got its current name. Now its products contain innovative ingredients such as Vital ET® and Acnacidol® created by the specialists of Elfa Laboratories. The series consists of ten effective yet affordable skincare products for daily care such as face and eye creams, different kinds of cleansers, toners and others.